Hi everyone – it’s Diana again. You may remember me from the post directly below this one, where I encouraged Arts students to attend HSSL’s MyArts Research library skills workshops. 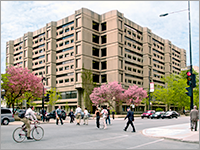 I am a graduate student at McGill’s School of Information Studies, and I’m currently completing a practicum at the Humanities and Social Sciences Library. The practicum is an opportunity to gain professional experience using the theoretical knowledge I’ve gained in my courses, and this practicum has allowed me to develop my teaching skills through information literacy instruction. I’m sure anyone reading this would agree that there is an enormous amount of information out there – any basic Google search, returning millions of results in seconds, demonstrates that. Being information literate allows you to wade through it all. It’s how to know when you need a piece of information, how to find it, and how to critically evaluate and make use of what you’ve found. And a big part of every librarian’s job is helping you do that, either in one-on-one interactions or in workshops like MyArts Research. For my practicum, I’m putting together a literature review, taking a look at how other universities teach library resources and research skills, writing these blog posts, and – best of all – teaching workshops. I showed students how to navigate the library catalogue, how to narrow and shape a research topic, and how to use the Library’s core databases of academic literature. We also looked at ways to use Google effectively, explored some of the reference tools available on the McGill Library website, compared peer-reviewed and popular articles, and reviewed advanced search strategies. These are all skills an information literate student can use when doing research. The best part, though? The moment I saw the light bulb go on above a bunch of heads. That was the moment I realized students had learned something useful for their research process, from me. And that was fantastic. Join us at our March workshops for Arts undergraduates! It’s March, and paper season has officially arrived, so here’s a piece of advice for Arts students. Don’t be that guy. You know the one I mean: the one awake at 3:00 AM the night before the paper’s due, stuck on page 4 and out of ideas, taking frequent breaks to scroll through a Facebook feed that never refreshes because everyone else has already gone to bed. Poor guy. He probably could have avoided the late night if he’d just been more on top of his research. If he’d chosen a manageable topic and developed a smart search strategy. If he’d used the library website to identify relevant, current scholarly sources in his subject area. If he’d learned about the citation management software for creating a bibliography. Luckily, McGill’s Humanities and Social Sciences Library can help you avoid becoming that guy. The two-module MyArts Research: Library Skills for Success workshops, being offered March 11 and 12, will help you develop your research skills and show you the many library resources and tools you can use to do your research more effectively. In Module 1: How to Search, you’ll learn how to choose and shape a research topic, how to develop a search strategy and find the best sources in a variety of formats, and learn some of the features of the Library website and catalogue. In Module 2: How to Manage it All, you’ll explore subject-specific databases and get a crash course in using EndNote citation management software. Yes, it’s a McGill Library bracelet. But it’s also a USB key! 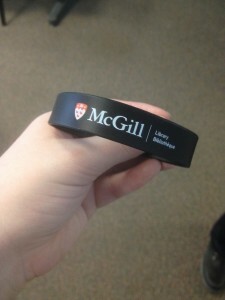 Plus, an added bonus: students who attend both workshop modules will receive the world’s greatest fashion accessory, a 2GB McGill Library USB key that also happens to be a bracelet. Register now for one or both modules – and never be that guy again!